If a fighter jet flies over a $1.2 billion stadium, but no one in the stadium can see it; does that fighter jet make a sound? Well, of course it does, it’s a mother bleeping fighter jet, but many are left wondering why the Navy is flying four F/A-18 Super Hornets over this year’s Super Bowl if stadium officials have already said Cowboys Stadium’s roof will be closed for the game. Sure, the schmucks — or lucky bastards, however you see it — who paid a minimum of $600 for a seat will get to see the fly over on Jerry World’s big screens, but that’s just not the same, right? Just another reason why it pays to stay home rather than travel out to these games. 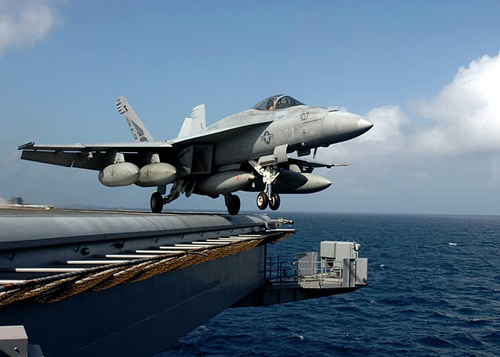 The Super Hornets are assigned to Carrier Air Wing 7 and the pilots come from Strike Fighter Squadrons 83, 131, 103 and 143, according to our friends over at Navy Times’ The Scoop Deck.